Where are you right now? Is there a window nearby? If so, take a moment and look at it–not through it– at it. Consider, how many panes of glass are there? How is it assembled? And furthermore, what type of polymer technology might allow that window to function as needed? You may be surprised to hear that, as a polymer company, we work on a lot of window projects. 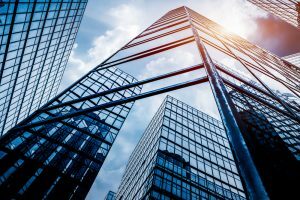 After all, you likely hear “window” and think “glass.” Depending on the window type, there is a good chance that polymer technology has a critical role to play, in terms of an adhesive used or a coating applied. When window analysis is part of a litigated matter, we become part of a larger team of experts and collaborate with fenestration experts — specialists in doors and windows of buildings. Very large windows are often referred to as Insulated Glass Units (IGUs) because they are a complex assembly of glass panes, coatings, and spacers that assure the assembly insulates inside and outside temperatures from each other. In order to connect all those various components, the spacer — often aluminum — is adhered to the base of the window with polyisobutylene (PIB). Between the various panels of glass there is air, or sometimes a different gas such as argon. Each pane of glass, as part of an IGU, could also have a unique coating to serve purposes such as solar reflection. If you gaze up at a large skyscraper, you are gazing upon repeating rows of IGUs. Can you guess what technology we have to thank for hurricane resistant glass? Polymer technology! For this type of window, the glass is laminated to a polyester film and often has an additional interlayer between two or more layers of glass. This provides enhanced resistance to impact and ensures that if the window is compromised and shatters the shards will not go flying. The current “Gold Standard” for Hurricane Resistant windows is the Miami Dade hurricane impact test, which was implemented in 2001 after the widespread destruction of Hurricane Andrew. This testing involves assessing the ability of glass panes to resist impact from large and small missiles. Windows have a major role in saving an overall structure during a hurricane, so the fact that there are strict standards within hurricane prone areas is understandable. This is a great example of how polymer technology can be applied to support safer communities. When IGUs and other commercial grade windows–such as those that are bomb proof or hurricane resistant–function as needed and designed, they are both beautiful and functional! However, like many of the analyses we get involved in, there are times where things go wrong, and we are asked to get to the bottom of why. 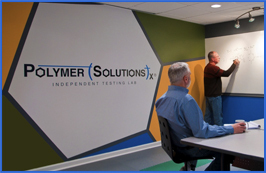 We are fortunate that at our state-of-the-art testing lab we have a myriad of powerful analytical capabilities, all under one roof. That gives us a host of tools, techniques, and options for a testing approach that will ultimately solve the debate regarding cause of failure with data. We are ready to apply our love for great science to a myriad of materials problems–to include defects and failures with windows. If you find yourself in need of expert analysis, give us a call!